Jeff gave a detailed treasurer’s report. Dan will coordinate the table reservations for the Holiday Sale. Members may reserve a Holiday Sale table at which to sell their creations for $10 but should do so soon; if space permits, nonmembers will be able to sell craft items for $15 per table. HVW will be demonstrating woodturning at the Webster Fall Festival on September 22; an email was sent out to all members, asking for volunteer demonstrators. There will also be an opportunity to sell your woodturnings for a small number of members in the club spot. The Saline Woodcarving Show will be on October 6 at the Saline Liberty school off Ann Arbor Saline Rd . Turners may sell their work at a sales table for a $15 fee. Contact Tom Jacobson at 734-476-3411 if interested. On Saturday, June 16, Jeff B., Dan K., and Bill A. demonstrated woodturning at the Art on the River event in Commerce. HVW will sign up as an “artist group” for future Art on the River events. The officers also discussed exploring possibilities for demonstrating at one of the Ann Arbor summer art fairs in 2019 (and possibly at other local art fairs). The President’s Challenge project is to create a turning with some sort of inlay; this inlay could be wood, metal, epoxy, turquoise, etc. Bring your project to the July meeting to show your work (and get a free “regular raffle” ticket). 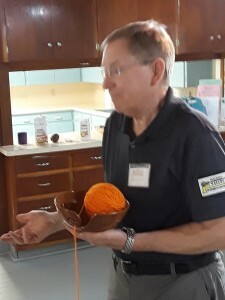 Dan B. showed a nicely crafted and rather novel “yarn bowl” that had a spiral cutout from the rim into the bowl’s wall; while a ball of yarn sits in the cherry bowl, yarn is fed through the cutout to the knitter, so the cutout must have no sharp edges. 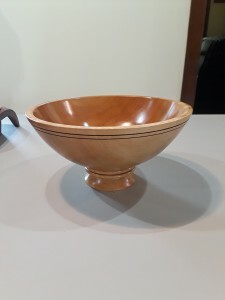 Jeff B. showed a sycamore bowl with a very nice “added base” that raised the bowl in order to better show off the bowl profile. The bowl showed the nice “ray fleck” figure to be found in sycamore; it was finished with oil and polyurethane. 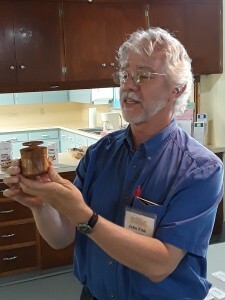 John F. showed a small hollow vessel with a wide top rim and short narrow neck; this was made from a piece of Crimson King Norway maple that had interesting color variations; he has a childhood memory of planting the tree with his father. 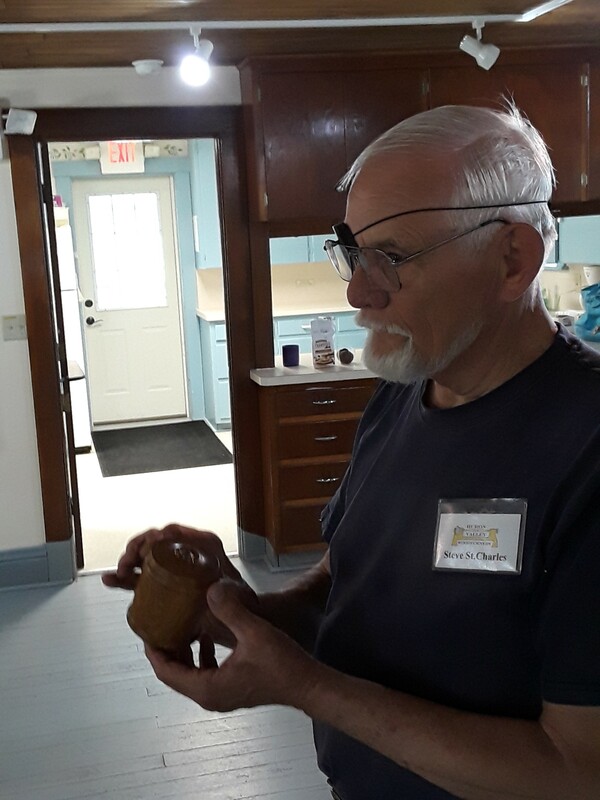 John also showed a small scoop made from a small branch from his apple tree. 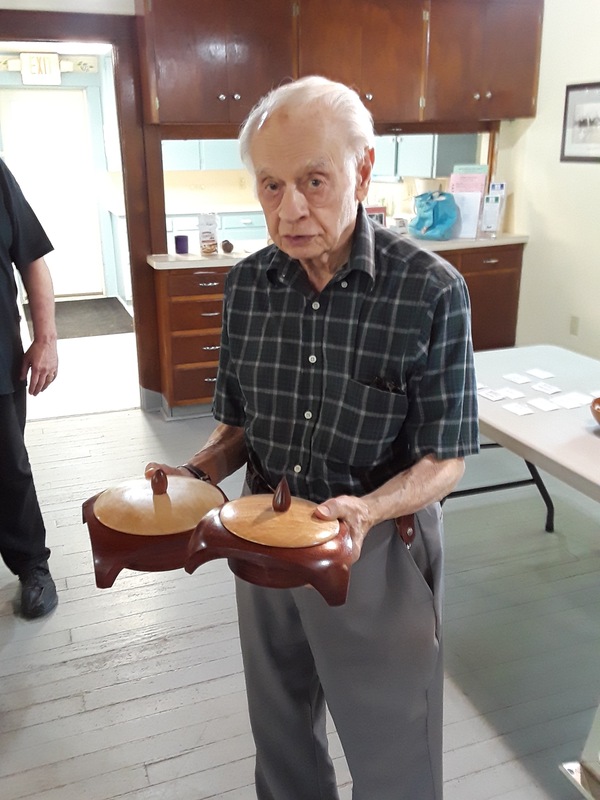 Steve SC showed a box made from rare Missouri-grown slippery elm; as a lid inlay, the box lid had a circular medallion from a pin owned by his nurse wife. Joe E. showed two nicely-made large winged boxes turned from padauk and figured maple. The winged bases have a square profile when viewed from above; the wings curve out and down from the circular rim of the box bases. A variety of turning blanks were distributed in the raffle: these included chunks of locust, walnut, narra, figured maple, and osage orange. Karl Anderson presented “Why tools get dull — tool life.” He discussed the four main factors that affect woodturning tool life: hardness of the tool, cutting-edge angle, cutting speed, and the composition and hardness of the wood being cut. The bulk of the presentation was about steel that can be hardened, and it was emphasized that with proper quality control in manufacturing, woodturning tools can be made to a (Rockwell C) hardness of HRC 68; furthermore, those tools need not be brittle. He would not buy a tool that has a hardness less than about 64, but most woodturning tool manufacturers do not provide the hardness rating so it is “hard” to determine this. Karl demonstrated the hardening of 0.8% carbon steel drill rod using a MAPP gas torch; such steel can be hardened by heating to 1450 °F and quenching it in water or oil; it can then be tempered in an oven at 400 °F for 15-30 minutes. If one follows proper safety measures, and establishes the tool shape and profile prior to hardening and tempering, this process can be used at home to make small woodturning tools (e.g., scrapers and skews). Thanks to Karl for an engaging and very informative presentation!